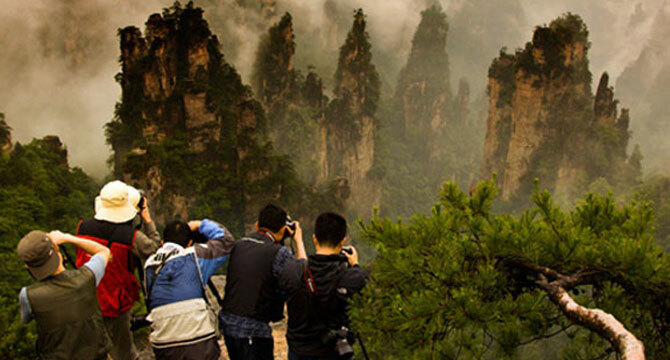 Welcome to Zhangjiajie, your gateway to the Zhangjiajie National Forest Park! At Zhangjaijie Hehua International Airport (DYG), you meet your tour guide and then drive about 40 minutes to the hotel in Wulingyuan District. Balance of the day is at leisure. After breakfast, drive to Zhangjiajie National Forest Park. Take the cable car up to the Yellow Stone Village Scenic Area to enjoy a 2-hour walking trip on the awesome mountain. Afternoon proceed to explore the Golden Whip Stream. This charming valley is most likely to bring you into the Pandora's wonderland of the movie Avatar. You will have a leisure hiking about 2.5 hours along the stream. It is leisure and comfortable to walk through the stream, especially hot summer. Morning we will ascend the Yuanjiajie Mountain by Bailong Elevator - a glass elevator built into the side of the mountain. On the summit, take about 2.5 hours to discover the Pillar of the Southern Sky. It was used to inspiration for the famous "Hallelujah Mountains" in Blockbuster's movie, Avatar. Move to the Platform of Forgetfulness to enjoy the nearby peak views and then walk across the No. 1 Bridge under Heaven. Afternoon, climb up the beautiful Tianzi Mountain Nature Reserve to visit Helong Park, West Sea Scenic Area and some other sights. Later, take the cable car down the mountain to enjoy a walk along the picturesque Ten-mile Natural Gallery (mini train is optional). End the trip with a transfer to the airport.